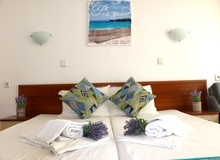 Tabanov Beach has 38 stylish rooms furnished with double bed, wardrobe, balcony and bathroom with shower. Additionally equipped with a host of modern amenities such as LCD television with cable TV, internet connection, air-conditioning, telephone, refrigerator. 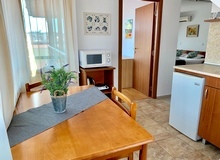 With their functional interior, studios Tabanov Beach are ideal for comfortable accommodation for a couple or family. 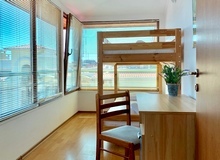 They are furnished with a double bed, sofa, wardrobe, balcony and bathroom with shower. Each studio has a kitchenette with refrigerator, microwave, stove and sink. Additional facilities in the studios include LCD cable TV, internet connection, air-conditioning, telephone. Tabanov Beach Hotel offers two suites to its guests. They are equipped with a kitchenette with refrigerator, microwave, stove and sink. Guests one apartment can accommodate a large bedroom and a sofa bed, and the other - a large bedroom, a sofa bed in the living room and bed sandwich in the nursery. 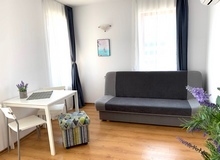 Additional features include an LCD TV with cable TV and DVD player, internet connection, air-conditioning, telephone, wardrobe, balcony and bathroom with shower.